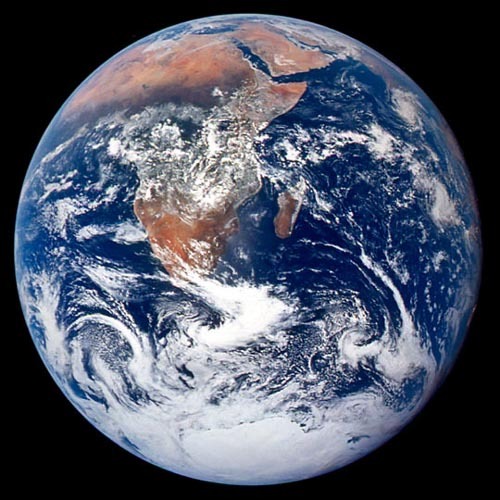 This image, called "The Blue Marble", is among the most famous photographs of the twentieth century. As astonauts departed for the moon, they beheld the earth in its entiretythe first humans ever to do so. This image, taken from Apollo 17 on December 7, 1972, features most of Africa, while portions of the Atlantic and Indian Oceans are visible, as is Antarctica, to the south. At the northeastern edge of Africa, the Arabian Peninsula can be seen. To the east off the coast of Africa is the island of Madagascar Republic. On the northeast is the southern Asian coastline. Note the absence of clouds over the desert regions of the Sahara and Kalahari of Africa.